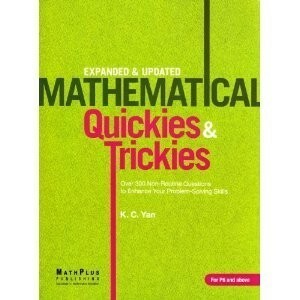 What is the difference between “trick questions” and “tricky questions” in mathematics? Can you spot them to avoid being fooled by them? “Trick” questions are difficult because they often conceal or omit information, or because information appears in an unfamiliar setting. Trick questions are set to mislead the unwary — the novice problem solvers. Trick questions often disguise themselves in the form of riddles and conundrums. Let’s look at two examples of trick questions. Joe cycles from home to school, a distance of 2 kilometers. If he cycles the first kilometer at 5 km/h, how fast will he have to cycle the next kilometer to average 10 km/h? Every wife had seven sons. Every son had seven dogs. Every dog had seven puppies. How many in all were going to Mathland? Did you get 15 km/h as the first answer, and 2803 as the second answer? If yes, welcome to the company of trick-allergic people. Don’t give up so easily. Look at the questions again. Figure out why the two answers are wrong. Resist the temptation to peep at the hints. “Tricky” questions are “fair”; they don’t usually conceal information or depend on some words, which may be misinterpreted. In fact, tricky questions often contain redundant information, which needs to be filtered. Trickies are problems whose numerical data make the problem meaningless — unrealistic problems. The sensibility of the answers serves as a guide to warn the problem solver that the question may contain redundant or insufficient information. An experienced problem solver will notice the unreality or impossibility of the problem’s specific data. Here are two “tricky” questions. Write, in algebraic form, the general form of numbers that, when divided by 3, leave a remainder of 5. The perimeter of a right triangle is equal to 3.92 m. Two of its sides are 1.25 m each. Find the third side. Did you get 3n + 5 and 1.42 m? Or, are you more tricky-sensiive this time? What are the correct answers to these mathematical trickies? 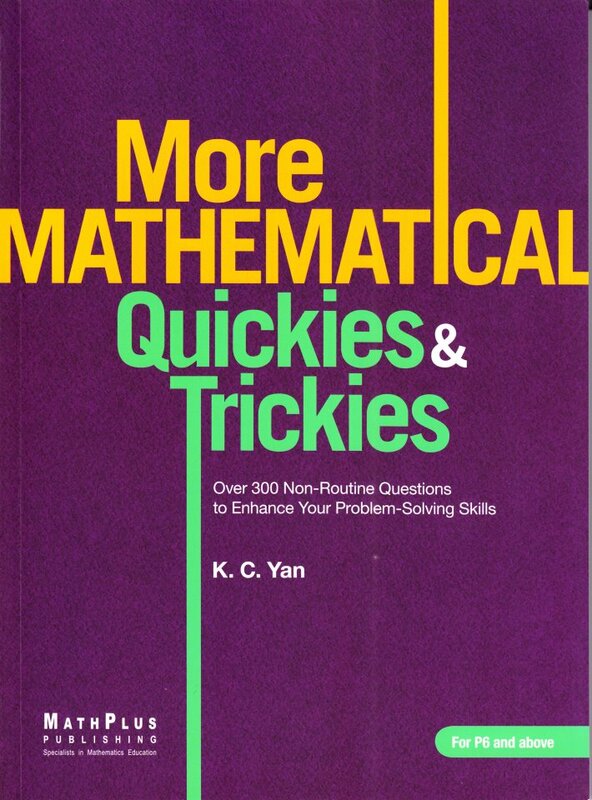 May I direct you to the Mathematical Quickies & Trickies Fan Page for more trick and tricky questions in elementary school mathematics? Or, you may order some titles under the Mathematical Quickies & Trickies series at Amazon.com or download a soft copy from iTunes. © Yan Kow Cheong, May 21 2014. This entry was posted in Math Writing, Singapore Math, Singapore Publishing and tagged creative problem solving, enrichment math, math competition, math contest, Mathematical Quickies, Mathematical Quickies & Trickies, Mathematical Toughie, Mathematical Trickies, problem solving, Quickies, recreational math, Singapore math, Singapore mathletes, Toughies, Trick, Trick & Tricky Math Questions, Trick math questions, Trick question, Trickies, Tricky, Tricky math questions, tricky question on May 21, 2014 by Yan Kow Cheong.